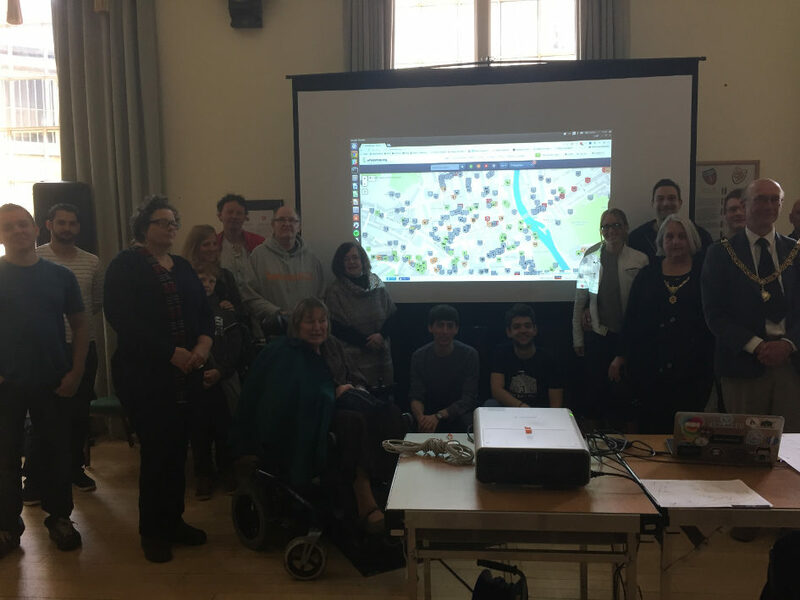 A team of 23 volunteers gathered together at the Guild Hall in the centre of Bath yesterday to help us launch our Accessible Bath project. While we’ve been promoting the project for a few weeks and had already begun mapping the city, this was our first public mapping event. Our goal was to see how much of the city we could map in a few hours. Our volunteer group consisted of people all ages, including long term residents, students from Bath Spa university, wheelchair users, stroke survivors. We were also pleased to have the Mayor join us for the event to help us begin mapping the city. 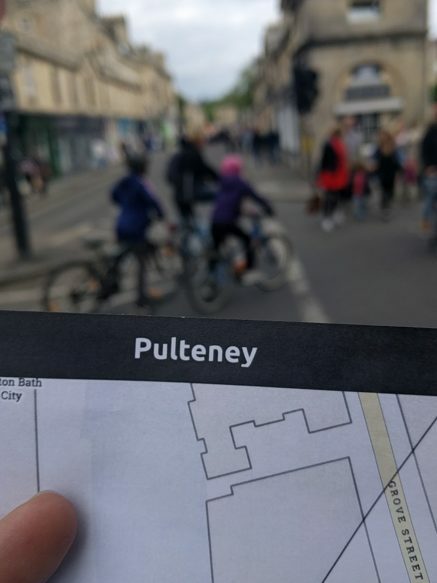 There was an incredible enthusiasm from the whole group, with the majority of people giving up their whole afternoon helping us to map the city. We started things off with a brief introductory session where we reviewed our guidance for mappers. Everyone was well prepared and most people had already installed the Wheelmap application. We then split up into groups who each took away one of our task sheets and then went out to map the city. Towards the end of the afternoon our mappers returned back to base camp to start tying up loose ends: uploading extra photos, adding notes and editing OpenStreetmap to add missing locations to the map. So, how much did we achieve in four hours? At the start of the day there were 381 rated locations in our target area, which amounted to 33% of our target. By the end of the event we had increased that to 683 ratings, increasing our coverage to 57%. That means our volunteers mapped 300 locations or 20% of the city! This is in an incredible achievement and a testament to the hard work of everyone involved. It also goes to show much can be done when you have a committed team of volunteers. Our progress chart provides a number of ways you can explore all of the the information we’ve collected. We’d like to thank everyone who came along to the event. It was fantastic to have so many people contributing towards making the project a success. The feedback from the wheelchair users in the group is that this information is so important to helping them feel comfortable in moving around the city. Everyone also seemed to really enjoy taking part in the event. You can see a few photos from the event here. We’re hoping to maintain this momentum so that we can achieve our target of 100% coverage by the end of October. Keep an eye our for news of our future mapping events, we’re hoping to run another one over the summer. But you can also contribute to the project to help us achieve the target whenever you’re out and about in Bath. It’s really easy to rate a location and will help us better understand accessibility across the city.